Purists will lament the lack of an available stick shift in Buick's Regal Grand National lineup, but the truth is when you are more man than machine, wear a floor length cape, have more buttons on your chest than a vending machine...well...an automatic transmission is a good thing. The Buick Regal was a G-body coupe from General Motors that introduced the US to turbocharged performance and in 1978 was one of three cars available with a factory turbo; the others were the SAAB 99 and Porsche 911 Turbo. While the 99 and 911 were available with manual transmissions beset with turbo lag, the Regal Grand National was an automatic transmission equipped cruiser that used a low pressure turbo and big displacement to create virtually instant boost response. 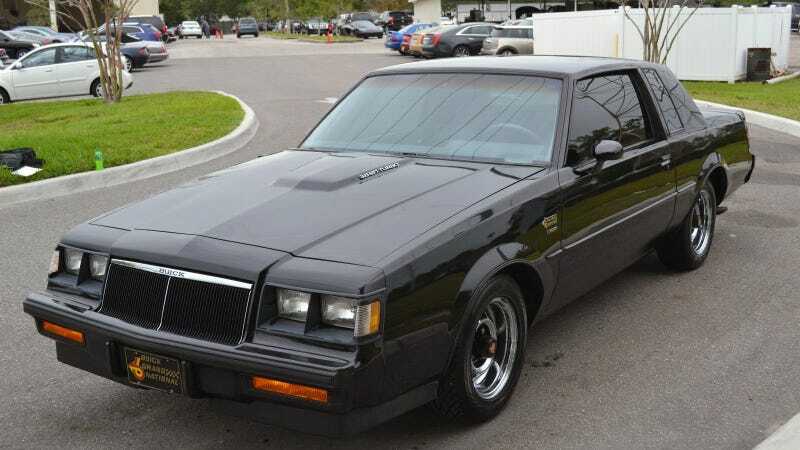 Find this 1986 Buick Regal Grand National for sale in Largo, FL currently bidding for $13,788 reserve-not-met with 3 days to go. The Grand National version of the Regal (named for the NASCAR Winston Cup Grand National Series) was only available in black with blacked out trim, a rear spoiler, front air dam and unique wheels. The Grand National was under 14 seconds in the 1/4 mile when new and could embarrass Corvettes, Ferraris and Lamborghinis alike at the 1320 ft mark. In 1986 the Grand National finally got an intercooler and the 3.8 liter turbocharged V6 was rated at 235 horsepower and 330 ft-lbs of stump pulling torque. A peak under the hood looked as foreign to US buyers in 1986 as popping the off Vader's helmet and seeing Anakin Skywalker's hideous scarred noggin. What are all those tubes for? Should this engine be wheezing this much? Unfortunately the Grand National was not available with a clutch pedal, so it is better suited for parking lot brake stands and drag strips, but it would make a great Friday night cruiser vehicle for hunting down the last of the Jedi scum. It's also a great vehicle for scaring passengers as the '80s GM-luxe unit body lack of torsional stiffness and braking power makes for an amusing experience when the turbo V6 is wound up to full power. Originally posted as: 15k: Vader's Coupe: 1986 Buick Regal Grand National on Daily Turismo.